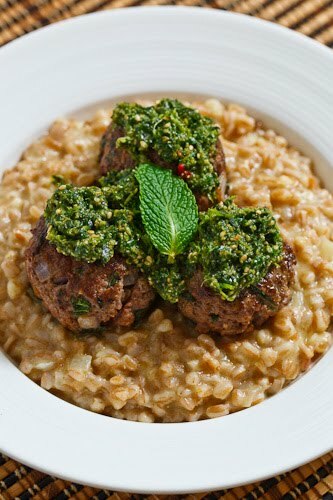 With spring here, I have been thinking about lamb more and when I came across the recipe for mint lamb meatballs with spelt risotto and cilantro pesto on What’s for Lunch Honey I just had to get it onto my meal plan right away. Lamb is a meat with a strong flavour which means that it goes well with herbs with strong flavours including mint and cilantro and this dish includes both! The mint is mixed right into the meatballs and there is a cilantro pesto on the side. Something that caught my eye about this recipe was the use of the cinnamon in the meatballs. I first came across the idea of using cinnamon in savoury meat dishes a while ago and I have been intrigued ever since and I am always on the lookout for new dishes that use the combo. These meatballs were really easy to make, though I do need some practice in the cooking meatballs in such a way that they retain their shape. The mint lamb meatballs were really nice! The mint and lamb flavour combo was wonderful and the cinnamon took it over the edge. When combined with the creamy risotto and the fresh cilantro pesto this was quite the meal and it really shouted spring. It is pretty hard to go wrong serving these meatballs with a creamy and cheesy risotto and if you make it a bit healthier by using a whole grain then it is all the better. I have made risottos barley before and I liked the sound of a spelt version, unfortunately I could not find the spelt but I did have some farro on hand. This is a pretty basic risotto with the only difference being precooking the farro a bit before using it to make the risotto as farro takes longer to cook than rice. The farro risotto came out nice and creamy and it was so good! I really liked the ‘al dente’ kind of bite or chew the farro had and I will definitely be making it again. If the mint in the lamb meatballs was not enough fresh herbs for you then how about some cilantro pesto? Cilantro pesto is pretty easy to make and it goes great with a lot of things including pastas, soups, sandwiches and of could these lamb meatballs. I liked the Asian twist on this particular cilantro pesto with the ginger and red chili pepper adding a nice hint of the exotic and a touch of heat. Continuing with the Asian theme I swapped the cashews out for some toasted and ground sesame seeds. Mix the lamb, mint, onion, egg, bread crumbs, cinnamon, coriander, salt and pepper. Form the mixture into balls. Add the balls a few at a time, without crowding the pan, and brown on all sides until the middle is cooked, about 10 minutes. Cover the farro in a lot of water in a pan, bring to a boil, reduce the heat and simmer for 20 minutes, drain and set aside. Heat the oil and melt the better in a pan. Add the farro and wine and stir until the liquid has been absorbed. Add 1/2 cup of the chicken stock at a time stirring until the liquid has been absorbed. Mix in the butter and cheese. You had the hard time with the meatballs because you forgot the binding ingredient. EGG. I love a touch of cinnamon in meat! To my mind, it's the thing that makes Greek Moussaka taste so good. Gotta try these. These look phenomenal! The middle-eastern flavors are right up my alley. In middle eastern seven spice that I use often, cinnamon is a big component, and gives everything such a nice warmth. Can't wait to try your cilantro pesto! You are not the only one who was tempted by this recipe on Meeta's blog. Meatballs a is one of my favorite comfort foods. this looks and sounds incredible! can't wait to give it a try. Lamb, farro and cilantro, those are three of my favorite ingredients! A marvelous dish! Kevin glad you liked this – yeah the cinnamon takes it to a new level. love the fact that the flavors intrigued you. Always get excited to see how my recipes are taken. A superb & healthy dish, Kevin!! I saw this on Meeta's site and absolutely fell in love. I'm a cinnamon and meat person too…love it wherever I see it. Cilantro pesto – awesome. Allspice is frequently used in Middle Eastern meat recipes. This is a gorgeous meal! All of the components are lovely on their own, but when combined together, I'm sure they make one fantastic dish. I'm especially excited to try the farro risotto! Those spices you are using with the lamb are my favorite! Lamb is one of my favorite ingredients that I really need to start cooking with more. I love the idea of these meatballs. The herb/spice combination sounds really interesting! oo..that is big effort on your part.. Plus creativity for sure. Love your presentation. Excellent dish. The combination is new to me. Thanks for sharing your ideas. Mmmm. I love everything about this recipe. I haven't make anything with lamb in so long. I just did a whole grain barley risotto and farro is next on the list. This does "look good". I appreciate all the comments; however, has anyone actually made it or is everyone suffering with premature anticipation? I think it would be more productive to hear from those AFTER they made it. Okay just made this for a culinary competition and just won first place. It's good.